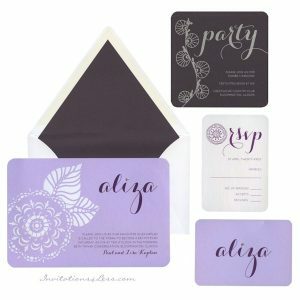 This ultra feminine Bat Mitzvah invitation on Grape card stock with rounded corners features a large, white foil stamped floral motif to the left of your wording details. A genuine Swarovski crystal provides the finishing touch to the Bat Mitzvah’s name. This ultra feminine Bat Mitzvah invitation on Grape card stock with rounded corners features a large, white foil stamped floral motif to the left of your wording details. A genuine Swarovski crystal provides the finishing touch to the Bat Mitzvah’s name in the upper left or may be placed in the center of the flower. Measures 7-3/4″ wide by 5-1/4″ high. Shown with raised Iris ink and combination lettering styles FONMYE3 (block text) and FONSXJY (script). 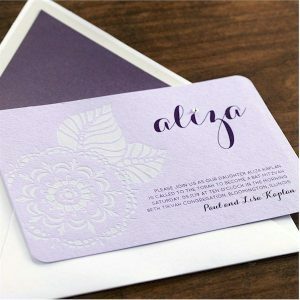 The coordinating Reception enclosures will print on square Aubergine card stock and the Response enclosures will print on Bright White stock. The Thank You notes will print on Grape folding stock and includes a Swarovski crystal. This Bat Mitzvah invitation is accompanied by plain, single Bright White Swiss-flap envelopes. Select the quantity of extra envelopes in case you make addressing mistakes below. Note: For invitations with double envelopes, this will include both inner and outer envelopes. Envelopes can be lined for an additional charge of $36 per 25. 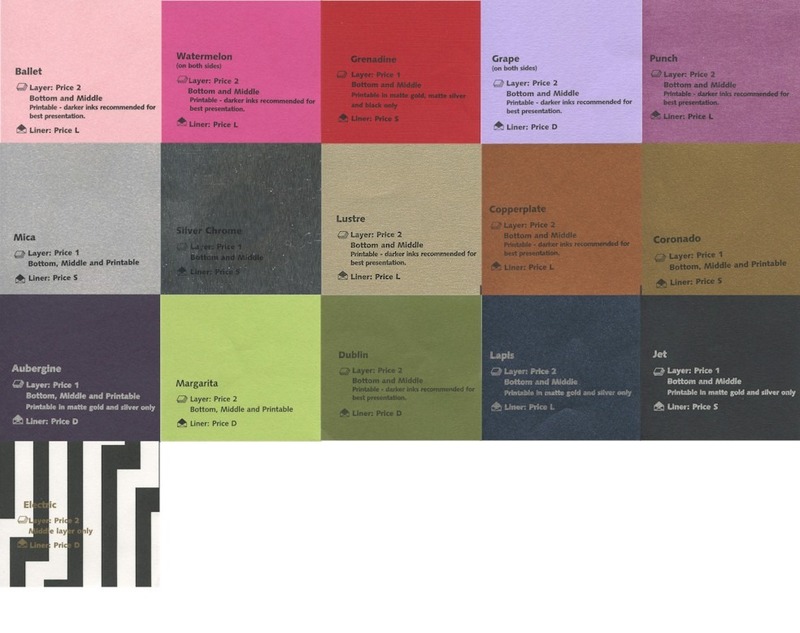 Select the Envelope Lining, if desired.Notes: Click on Envelope Lining for color swatches. Lining colors in the drop-down menu marked * are our staff's favorite choices for this invitation. If invitation includes double envelopes, the inner envelope will be lined. Your total quantity of (inner or single) envelopes will be lined, including extra envelopes, if ordered.